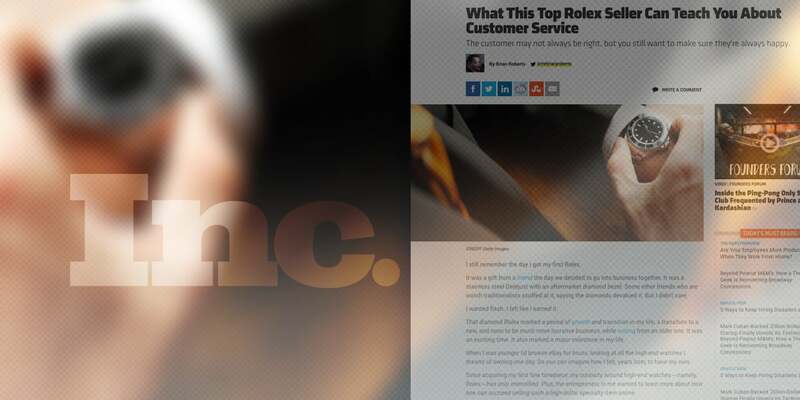 Did you see BeckerTime featured in Inc. Magazine this week? Writer, Brian Roberts still remembers the day he purchased his first Rolex – a stainless steel Datejust with an aftermarket diamond bezel. Since this purchase, Roberts’ curiosity on how one can succeed selling such a high-dollar specialty item online intensified. He reached out to BeckerTime to learn how we’ve thrived for the last two decades. In case you haven’t seen it, find some of the highlights below. Purchasing a Rolex marks a period of growth and transition in one’s life; it’s a major milestone. BeckerTime is one of―if not the―largest seller of pre-owned Rolex sellers on eBay for a decade now. BeckerTime attributes twenty years of profitable growth to great customer service. When you’re selling something high-value, trust is a large part of the transaction. When BeckerTime receives negative reviews we take it personally because we want every customer to not only love their purchase but also experience great customer service. BeckerTime aims to treat customers like family. Read the entire piece for yourself Inc. Magazine. Visit our Facebook to let us know your thoughts!